One day I asked my cat, Princess Sheba Darling, “Are you the best cat in the world?” As she purred her reply, I remembered I used to ask my old cat Couscous the very same question. (You can see a picture of Couscous on the FAQ page.) 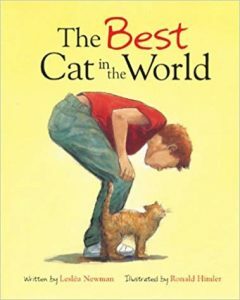 I realized that every cat is the best cat in the world, and so I wrote a book in which a child comes to the very same conclusion. When Charlie was a kitten, he had orange fur the color of a Halloween pumpkin and big green eyes that looked like two lucky marbles to keep in your pocket. But now Charlie was old. His orange fur was full of white patches, and grey clouds floated across his eyes. Charlie used to play with his favorite toy, a ball of red yarn tied to a stick, all the time. But now Charlie was too tired to play. Mostly he just napped on my bed. At night he slept on a special pillow right next to mine. “Who’s the best cat in the world?” I asked him after Mom shut the light. Charlie purred a rumbling reply.